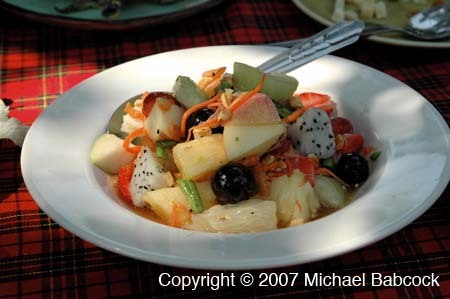 Thai Fruit Salad: A fruit salad (Dtam Ponlamai) at Gaeng Rawn Bahn Suan restaurant in Chiang Mai. We've not seen it elsewhere in Thailand. One of the advantages to traveling with Kasma is that she has spent years ferreting out the best dishes to eat at the best places to eat all over Thailand. You can learn to make this salad in Series Set G (class 4). You might also enjoy seeing Kasma's Thailand Trips Food Sampling photographs.